The Coptic Orthodox Diocese of Los Angeles, led by His Grace, Bishop Serapion, congratulates the Egyptian people for the historic showing of millions of Egyptian citizens demanding to be heard. It was not a military coup, but rather a popular uprising in which the military implemented the will of the people of Egypt. “Egypt is facing a lot of challenges which need the work of all Egyptians together without exclusion of any group. 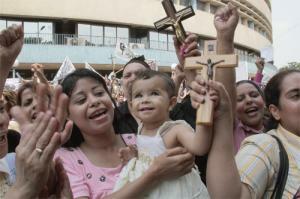 Egypt also needs the support of all nations and people who support freedom and justice,” said Bishop Serapion.